The name "Mido" comes from the Spanish "to measure". It is pronounced "Me-doe", not "My-doe". Kathleen Pritchard in "Swiss Timepiece Makers 1775 - 1975" states that the Mido Watch Company was founded in 1886. In their book "Technique and History of the Swiss Watch" Jaquet and Chapuis illustrate in Plate No. 148 a pocket watch, presumably an anniversary model, marked around the bezel "Henry Schaeren" and signed on the dial "Melik Mido 1886-1936". Thanks to Bruce Shawkey for drawing this latter item to my attention. Both items concur on the date 1886, but there is no more information about the company in either book until the early part of the 20th century. The Mido watch company are now part of the Swatch group of companies, and their history states that the modern company, "Mido G. Schaeren & Cie SA", was founded by Georges Schaeren in Solothurn, Bienne, on 11 November 1918. Whether there is any connection between Henry Schaeren and the Melik Mido company of 1886 and Georges Schaeren and the Mido Watch Company founded in 1918 is not known. The Mido Watch Company that was founded in 1918 started out as a sort of novelty or designer brand, making art-deco styled watches with coloured enamelled shaped cases, departing from the strictly functional appearance of a watch, making watches that could be worn as much as accessories as timepieces. In the 1930s they made some watches in the shape of radiator grills of well know brands of motor cars such as Bugatti, Buick, Excelsior, Peugeot, and Chevrolet. Two Mido trademarks are shown to the right. The first one is from a watch movement dated to the 1930s, the second is from Pritchard where it is given a date of 1957. 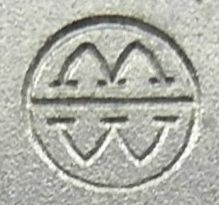 The mark is a clever representation of the M and W of Mido Watch. Mido significantly changed direction in 1934 when they introduced the Mido Multifort watch. This watch was waterproof, antimagnetic and impact resistant, and provided the Mido brand with a totally new image of serious watchmaker, not just a "fun" brand. In 1935 the Mido Multifort Automatic was introduced, bringing together for the first time the four features of self winding, watertight, antimagnetic and impact resistant. This was very early for a watch with all these features. The Multifort and its derivatives became the best selling Mido watch until the 1950s and was the foundation of the company's success. Like many other Swiss watch companies, in the 1970s Mido suffered during the "quartz crisis". This part of the history of the company seems to be "dark", I have been unable to discover much about it. Mido became part of General, which was assimilated by ASUAG in 1971. ASUAG collapsed in the early 1980s under pressure from quartz watches flooding in from the far east. 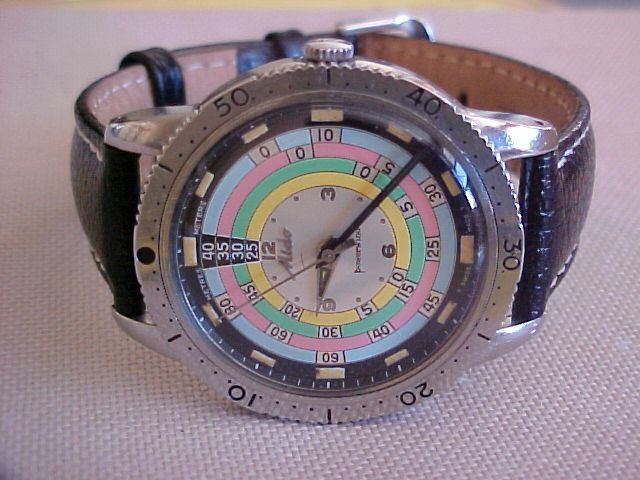 ASUAG was rescued by Nicolas G. Hayek who turned it into Swatch, and today Mido is part of Swatch. However, the company seems to have lost all records of its history in the process. The waterproof cases for these Mido watches were supplied by Taubert & Fils, who had taken over The Borgel Watch Case Company of Geneva in 1924. The cases were the Decagonal waterproof design having a screw back with 10 flats and cork sealing for the winding stem that the Tauberts had developed and patented in the late 1920s and early 1930s. 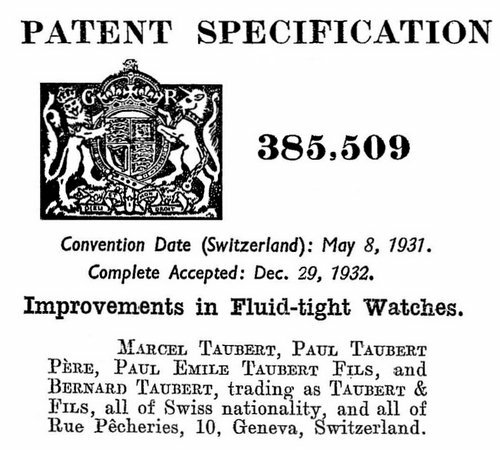 For more about the development of the waterproof Taubert Decagonal watch case, go to my page about Taubert & Fils. The impact resistant qualities of the Mido Multifort were conferred by the Incabloc shock protection system developed by Fritz Marti and Georges Braunschweig that protected the delicate pivots of the balance staff from shocks. For more about how this works see shock protection. For an interesting anecdote about how Bernard Taubert and Georges Braunschweig sold their respective waterproof watch case and shock protection system to the West End Watch Company in 1934, the year that Mido acquired the same technologies, see The Tauberts and The West End Watch Co..
Patent CH 346175 "Montre étanche"
The relationship between the Taubert watch case company and Mido lasted at least into the 1960s. 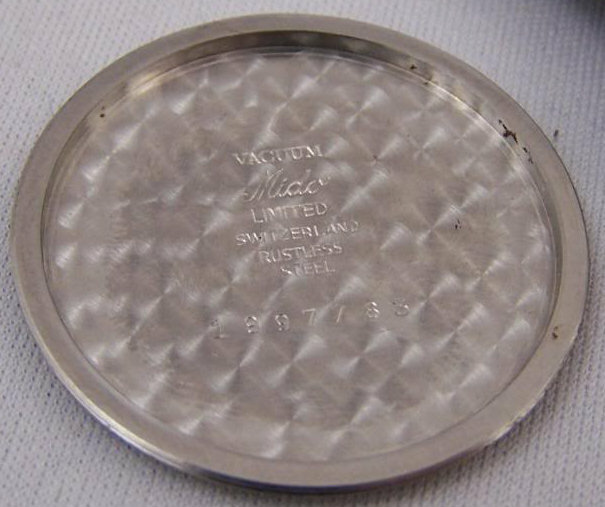 Evidence for this can be seen in a range of waterproof wristwatch cases supplied by Taubert to Mido stamped with the Taubert trademark "Vacuum" and the number "+346175". This number refers to a Swiss patent for a "Montre étanche" (waterproof watch) registered by Bernard Taubert on 16 April 1958 and published on 30 April 1960. 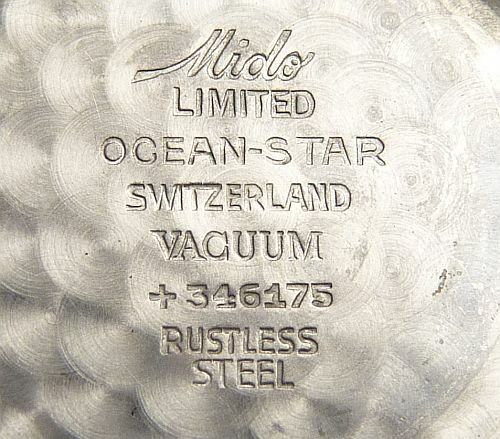 These Taubert "Vacuum" cases were used by Mido in the Ocean Star range of wristwatches, including a dive watch that was stamped on the outside case back with an image of a Scuba diver and the words "Guaranteed 300m / 1000 ft". Not a bad depth for a cork stem seal. This style of waterproof case, today called "top loader" or "front loading" was very widely used in the 1960s and 1970s. I am not sure whether Mido was the first company to use this design but, given their evident close relationship with the Taubert company, it seems likely that they were. The picture here is from the case back of one of these Mido Ocean Star watches. The Taubert trademark "Vacuum" is clearly seen above the sign of the Swiss Federal Cross, which in this case indicates a Swiss patent, followed by the patent number like this: 346175. 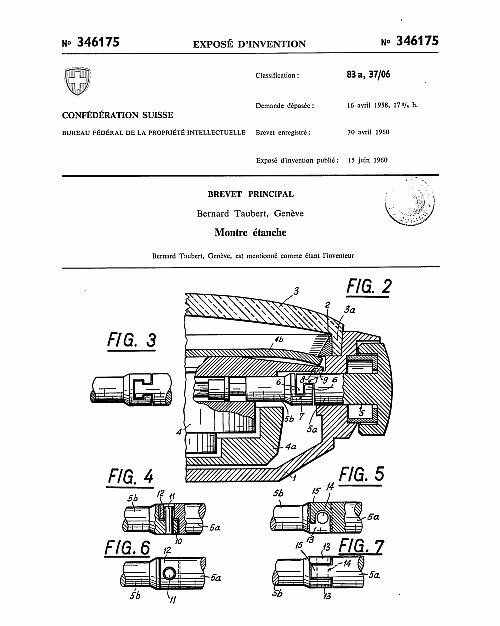 Patent CH 346175 "Montre étanche" (literally a "tight watch" but translated as "waterproof watch") was registered by Bernard Taubert on 16 April 1958 and published on 15 June 1960, as shown in the extract reproduced here. The salient features of this patent were that the case was made in one piece with no separate back, very much like the original Borgel one-piece screw case. The movement was introduced into the case through the top or front opening, hence the name "top loader" or "front loader" for this case design The movement and dial were then held in the case by the crystal through an intermediate spacer ring. This meant that the movement had to be put into the case before the part of the winding stem that passes out through the case wall was coupled to the movement, which was exactly the same problem François Borgel had faced in 1890 when designing his one-piece screw case. Borgel overcame the problem by using a two piece winding stem, one part fixed in the movement and one part fixed to the case, and Bernard Taubert adopted a very similar solution. Borgel's solution was to make a sliding joint between the two parts of the stem, fixing the outer part of the stem to the case with a spring so that it could be withdrawn to remove or insert the movement. However, this required a separate pin set mechanism for hand setting. For the top loader case Bernard Taubert also designed a winding stem that was in two parts, one part fixed in the movement and the outer part removable. To allow stem setting and avoid the need for a pin set mechanism, the joint allowed to two parts of the stem to separate when the movement was removed from the case, but coupled them both axially and rotationally so that the watch could be wound and set by the stem. The design of this joint can be seen in the drawing from the patent where "Fig. 3" shows a cross section of the stem. The winding stem was, of course sealed by the tried and trusted Taubert cork seal, which is not mentioned in the patent but can be clearly seen in the accompanying diagram, which Mido called the "Aquadura crown sealing system." "TO REMOVE MOVEMENT 1. Turn Mido name on crown horizontally — dial up — crown pushed in. 2. Invert case, movement will come out." Inserting the movement into the case was the reverse of this. The crown was oriented so that the projection on the end of the stem lined up with the slot in the part of the stem in the movement and the movement simply dropped into the case. This is a slightly fiddly operation and most watch repairers simply pull hard on the crown until the joint snaps apart, and all the movements I have seen in this type of case have the joint shaped to allow this, which is different to how the joints are shown in the patent. It must have been a fairly early modification. I have also seen it suggested that the crystal can be removed from of these watches by pumping air into the case once the stem has been removed, the crystal being literally blown out. Presumably not every watch repairer had access to the correct tool, or even knew of its existence. These cases were used from 1959 in the Ocean Star range of watches by Mido, including the Mido Ocean Star diver’s watch with its amazing multicolored dial shown here. This watch is stamped on the outside case back with an image of a scuba diver and the words “Guaranteed 300m / 1000 ft,” which seems a pretty amazing depth for the cork stem seal, I wonder if there were ever any claims under the guarantee?. 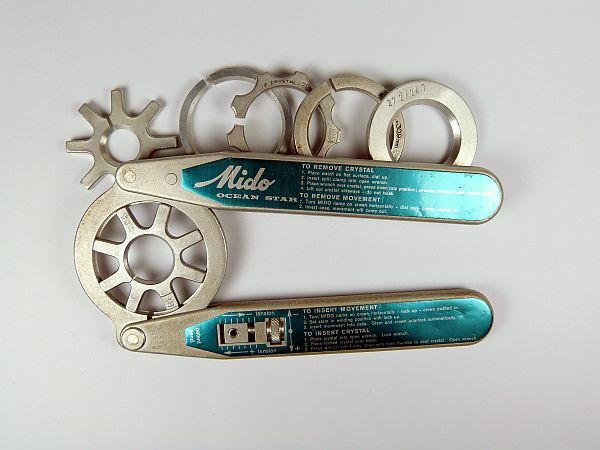 In recent years Mido advertising material claimed that the cork sealing system, which Mido call "Aquadura", was invented by Mido and patented in 1934. 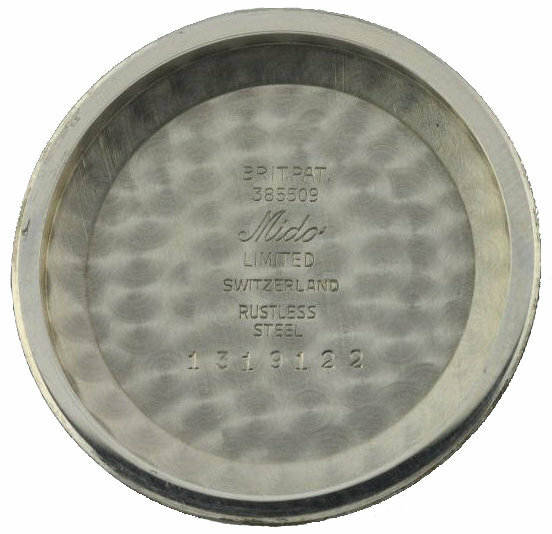 In fact, although there are a number of patents registered to Mido, I have found none dated between 1930 and 1940. I am certain that Mido first encountered the cork stem sealing system in 1934 when Bernard Taubert showed them the Taubert patented waterproof Decagonal case with its patented cork seal for the stem, and that over time the recollection of this has become blurred due to loss of the original records and staff through company changes. In 2008 on the 90th anniversary of the founding of Mido, director Franz Linder introduced a new watch at Baselworld, the Mido Jubilee. This watch used the Aquadura cork stem sealing system, and so far as I am aware, Mido are still using these cork seals in watches today. Not bad for a design conceived by the Tauberts in the late 1920s! Mido compete with the winemakers for cork to make waterproof watches. The system, patented in 1934, has never been matched by synthetic seals. Franz Linder, director of the Bienne brand, presents its latest creation, Jubilee, sealed with cork. Using cork to make a waterproof watch: this invention patented in 1934 has never been matched by synthetic seals called "o-ring". The Bienne watchmaker Mido thought of using cork to seal the crown, the weak point of all dive watches. In the Aquadura system, the stem of the crown passes through a tiny cork gasket compressed in a housing, which ensures a seal even if the crown is not fully pushed-in. "Like a bottle of wine that remains sealed even if the cork is half-drawn," compares Franz Linder, Director of Mido. Compared to the vintners, the Bienne watchmaker is not a big consumer of Portuguese cork. But as its seals are tiny, they cannot bear the slightest defect of a poor quality cork. "Two thirds of the handpicked seals go in the garbage," says the director of Mido. Natural cork is heated and greased to ensure its moisture, but the real difficulty lies in the cutting of the brittle material: a small piece of cork falling into the case would be enough to stop the movement. The assembly is more difficult and more expensive than plastic seals." Hardly anyone goes under water to a depth of 50 m. But this system, "simple but brilliant" according to Franz Linder, assured the success of Mido in Brazil, Thailand or Indonesia, wherever humidity attack the movement. And, curiously, doctors around the world are happy to wear a Mido: "Simply because they often wash their hands ..." smiles the director. The use of cork in the watch is so efficient that Mido applied the "Aquadura" system in the chronometer "Jubilee" presented at Baselworld for the 90th anniversary of the brand. "With an automatic watch, the cork wears only during setting the time or date ..." notes Franz Linz.